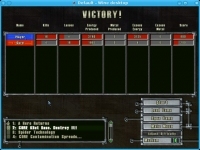 GOG.com - Total Annihilation: Commander Pack - Unterstützte Software - PlayOnLinux - Run your Windows applications on Linux easily! 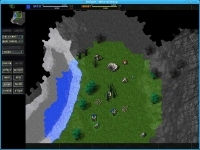 English: Total Annihilation and its expansion packs The Core Contingency and Battle Tactics... 245 units, 175 missions, 90 multiplayer maps, and 12 3D worlds, the ultimate edition for real time strategy fans. Français : Total Annihilation et ses deux extensions The Core Contingency et Battle Tactics... 245 unités, 175 missions, 90 cartes multijoueurs, et 12 mondes en 3D, la version définitive pour les amateurs de jeux de stratégie temps-réel. 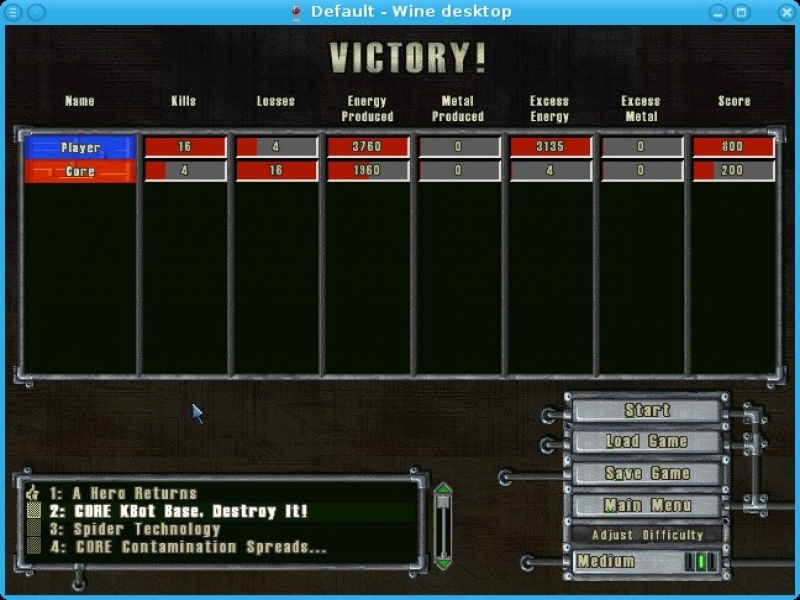 TITLE="GOG.com - Total Annihilation: Commander Pack"
POL_Shortcut "TotalA.exe" "$SHORTCUT_NAME" "$SHORTCUT_NAME.png" "" "Game;StrategyGame;"
POL_Shortcut_Document "$SHORTCUT_NAME" "$WINEPREFIX/drive_c/GOG Games/Total Annihilation - Commander Pack/manual.pdf"
First of all this program runs just fine after installation, The thing that you have to do though is not use the wine version that the script installs for you. Otherwise I just ran into crashing as soon as the game got past the intro videos. Within Linux Mint 17.2 I installed the latest Wine that it would allow without adding repositories, which is Wine version 1.6.2. All you have to do after installer runs is switch the Wine version within the configuration of PlayOnLinux to direct to the system installed version instead of the 1.5.9 that it installs with the script. After that the game would run just like I would expect on an old windows box. 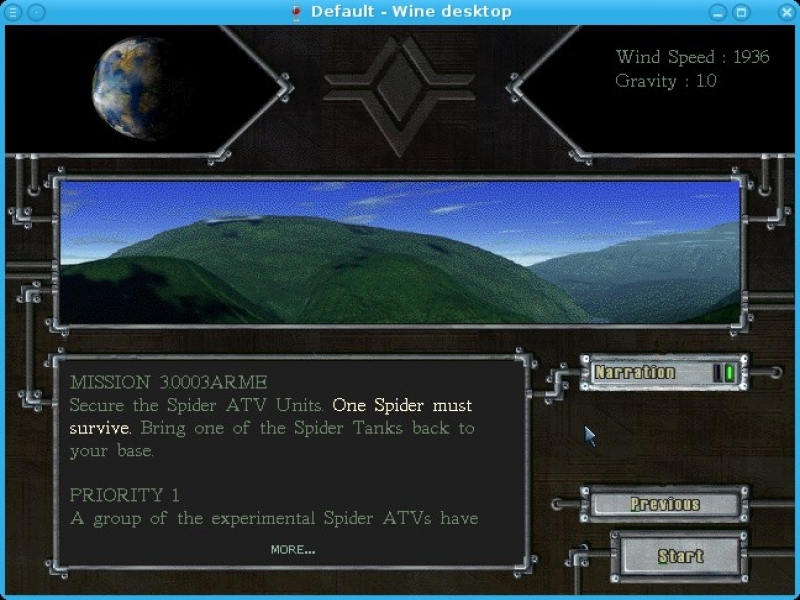 Another thing that may be useful to note is setting Wine to emulate a desktop is helpful from what I read around the net, and to not allow the window manager to be able to manipulate windows. I would submit an improvement, but I would have to learn what the coding is as I do not want to break it for someone else. 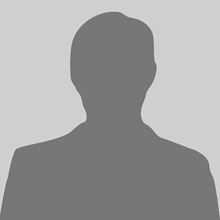 Does it work with PlayOnLinux-packaged Wine 1.6.2, or does it work because you use a system Wine? Comments : The game complains about inability to select 640x480x8 graphics mode and won't start. I guess it is some issue with the card. I found a workaround is to use "Emulate virtual desktop" option. This allows to start the game and configure fullscreen gameplay in higher resolution. Perhaps a notification for user would be in order.